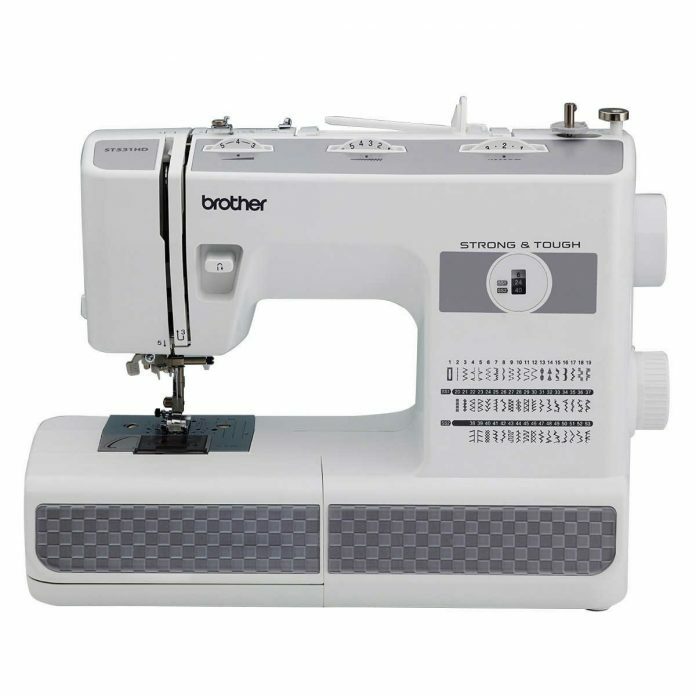 ᐉ Brother ST531HD Sewing Machine Review - Is It Really Tough? Home Sewing Brother ST531HD Sewing Machine Review – Is It Really Tough? Even though I adore sewing machines, I don’t envy people who are on the lookout for a new one. There are dozens of leading brands out there, each of which has hundreds of lines and models. Even if you aren’t ready to spend a hefty sum on a machine, you’re in for quite a bit of digging to find a perfect model. Too many features will confuse you and mess up the learning curve. Too few are likely to confine you. Computerized machines have hundreds of stitches and many automatic functions – as well as many things that can go wrong. Mechanical ones are cheaper to fix, but are often lacking in functions. Industrial beasts are often loud, expensive and robust, whereas portable ones can feel like toys. Your grandma had a much easier choice. A few brands with a few models. She made her choice and was stuck with it for the rest of her sewing career. Not that she was unhappy with it, though. Those things were built to last, and many a sewist has made her first stitches on her grandma’s sturdy old workhorse. Today I am writing a detailed review of Brother ST531HD, for those of you who have stumbled upon it and are now considering it as their first or next machine. 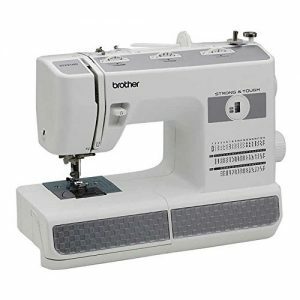 This model’s full name is Brother ST531HD Strong & Tough Sewing Machine, and for a good reason. It will punch through six layers of denim quite easily. And it will do so without ever endangering your fingers, thanks to the metal finger guard. Read on to learn what else it can and cannot do. 2 What Do Users Say? 5 Final Verdict – Should You Buy It? A single look at the model’s specifications won’t overwhelm you with tons of features. This machine isn’t a do-it-all, nor does it pretend to be. Here’s what you can expect from it. 53 built-in stitches. If you’re a novice sewist, it’s much more than you’ll need right now. Even advanced sewists won’t have much to complain about, unless their previous machine had hundreds of stitches that they regularly used. But in that case, they probably won’t even consider this one. To select a stitch, simply turn the dial on the side to match the stitch number. Six accessory feet. Included are buttonhole, button sewing, spring action zigzag, zipper, non-stick, and blindstitch foot. That’s more than enough to get you started. Automatic needle threading system. This feature is typical for high-end models, and I’m always thrilled to find it in an affordable line such as this one. Manual needle threading can be such a pain, especially for sewists suffering from vision issues. LED lights. This is to make sure your working area is always bright, even when you work at night. Quick-set top drop-in bobbin. It’s one of those features that Brother is proud of. However, it’s not present in all of their models, so I appreciated finding it here. A note of warning here: make sure to only use bobbins designated for this model. Maximum sewing speed is 800 stitches per minute. It’s an average speed, as far as portable machines are concerned. It’s nowhere near an industrial sewing machine, but it will get the job done. Adjustable stitch length and width. It’s easy to set this up – just use the dial on the top of the machine. Adjustable thread tension. It also has a special dial that you can use for dealing with different levels of fabric thickness. Reverse stitching. You can turn it on with a special lever. This option is great for reinforcing your stitch. Free arm option. It’s great for sewing cuffs, sleeves, legs, and other areas that would otherwise be hard to access. Tiny baby clothes also come to mind. Metal finger guard. I would say this feature makes the machine safe for children, but even adult sewists can get hurt if they are not careful. Those needles are fast! So, this guard should come in handy, so you can relax while sewing. This guard is also removable, for those of you who aren’t worried. Accessory storage. It’s in a removable portion of the base. Even though it’s not big, it can still hold some of your most important accessories, such as spare bobbins, needles and other tiny stuff that are easy to lose. Metal interior frame. Most machines within this price range are plastic from top to bottom, both on the inside and outside, making this feature that much more valuable. Metal needle plate allows for smooth fabric feeding. This part is one of the most important and exposed parts. If it were made of plastics, it would have been prone to easy breaking. And it’s pretty hard to replace. Such as it is, it’s not only more durable, but also great for the fabrics. Heavy duty needles come included in the package. You will get a 3-piece needle set (sizes 11, 14, and 16), as well as a twin needle. Customer reviews are not very easy to find for this model, and they are generally short. It means that the model hasn’t been very popular with sewists, even though the manufacturer is the U.S. favorite when compared to competitors. The scarce number of reviews is probably due to the fact that the model is pretty new. It was released back in 2017, so customers haven’t had enough opportunity to test it out. What little customer reviews we could find are mostly positive. Users are pretty happy with the machine’s performance when it comes to repairing jeans and quilting. Others complain that the machine is not as heavy-duty as one would hope. But we can’t even expect it to be, considering the price and the fact that it’s portable. If you need a workhorse that will labor for hours without breaking a sweat, you should consider an industrial machine. Some users complain that the plastic parts are easy to break and hard to replace, even with the warranty in place. A positive thing that everybody agrees upon is that the machine is very easy to set up and use. Even though it isn’t a true heavy-duty machine, it’s pretty robust. The “Tough and Strong” label isn’t a scam. You won’t have trouble sewing through thick materials such as denim or corduroy (even multiple layers of it). As for difficult and dense materials such as leather, I am not that impressed. But more on that in the cons section. Two feet for handling multiple layers of fabric and/or difficult fabrics. The spring action zigzag foot deals with multiple layers or varying levels of thickness. 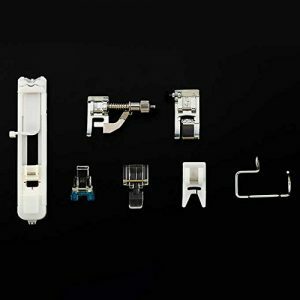 The machine even has a non-stick foot, which will allow gliding through leather – no need for hacks such as putting scotch tape or baby powder over your regular presser foot. The metal finger guard is an awesome feature. I know many a sewist, myself included, who has hurt their finger at least once in their sewing career. This protective feature makes the machine nice for your kids too, if they are into sewing. It’s a sturdy contraption. Even though it’s safe for kids, this machine is not a toy. On the outside, it’s made of plastics. However, the interior frame is made of metal, so it will be more durable and stable, without any wobbling or shaking while in use. A variety of stretch stitch patterns. The machine handles both thick and thin fabrics, but it also provides nice results with stretchy fabrics – especially if you pair those stitches with stretch needle. The stitches are strong and even. Even though this should come by default, you’d be surprised how rare it actually is with cheaper machines such as this one. The stitches are nice and uniform on both sides, even when it comes to thick or stretchy materials. Easy to set up. You’ll get both a printed and a DVD instructions manual, which makes setup a breeze. The automatic needle threading is easy thanks to the DVD, as well as self-explanatory guides and labels printed on the machine. The needle threading is advertised as automatic. I wouldn’t say it’s fully automatic, but it’s still very easy to use, as well as bobbin winding. Decent buttonhole system. It makes nice buttonholes at a right size, and works pretty well. Pretty affordable. So much so that you can even consider it as your secondary sewing machine. It isn’t very heavy (somewhat over 14 pounds), so you will be able to carry it around. It won’t do a good job with leather. Size 18 needles won’t fit with this machine. Even though they advertise the machine as almost heavy-duty workhorse, it won’t take any needles over size 16. And you might need those for sewing on leather that is really dense. For the sake of complete fairness – size 16 will do a pretty good job on thinner leather. If you exclusively sew with leather, however, this is far from ideal sewing machine for you. The needle will jam and make for a frustrating experience. Not the best choice for beginners. 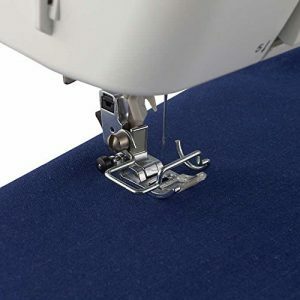 Adjustable thread tension, stitch length and width and other functions are very convenient for seasoned sewists who know what they are doing. However, newbies might have a hard time figuring these out, and they’re in for some painful trials and errors. For a purportedly heavy-duty model, the maximum sewing speed could have been higher. With the maximum of 800 stitches per minute, you won’t be able to boost your productivity sufficiently to suit your sewing business. All the components are plastic. As I said, I appreciate that the interior frame is metal. But it would be nice to have some crucial parts also made of metal. It would add to the durability. The LED lights could have been more bright. And that’s true for most Brother models that I’ve had a chance to try out. I’m not sure why they are so persistent with installing these dim lights when it’s not a costly feature. No protective case. You will have to purchase it separately to protect your machine from dust. As always, the verdict mostly depends on what kind of machine and performance you actually need. If you’re looking for a fancy machine with lots of bells and whistles, you’re in for a bit of disappointment. This machine only offers the basics, but what it does, it does pretty decently. 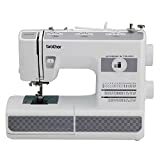 Based on what I’ve seen, I would say that this machine will be an excellent choice for those sewing enthusiasts or hobbyists who often need to tackle projects with thicker materials. Even though it’s not a real heavy-duty machine, it still outperforms your average portable machine. All parts are mechanical and there are no touch screens or any other computerized elements that could go wrong. All in all, I am pretty sure that this machine should last at least for a few years (more than enough to pay itself off), in spite of the fact that it’s mostly plastic. If you think it’s good for you but the price tag doesn’t agree with your wallet, you can pick its direct predecessor Brother ST371HD. It comes with fewer stitches and customizations, but it’s still one of the best Brother models within this price range.